This morning we headed out to the SW Corner of Stellwagen. 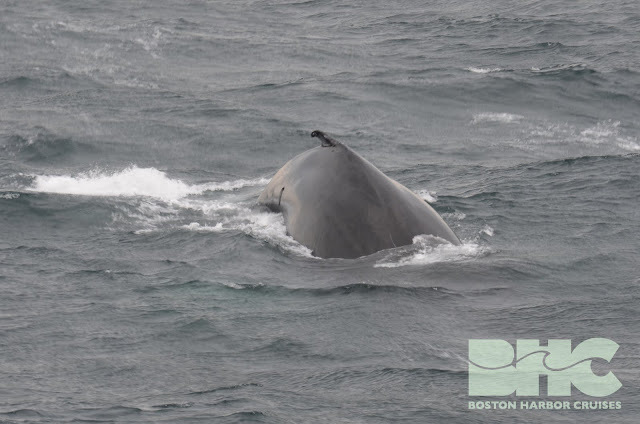 As soon as we crossed over onto the bank, we were excited to spot a massive mother finback whale with her calf! This pair was floating together at the surface and might have been nursing! After a minute or so, this pair ducked down on a dive. The next time we spotted these whales they had travelled a bit further away. After we caught up with them, they both dove once again, or so we thought. All of a sudden we spotted the young whale just below the surface directly in across the pulpits! Everyone on the bow got an amazingly close look at this curious calf! Very rarely are finwhales so interested in whale watch boats! After this encounter we moved on to check out some other whales that had been reported a few miles away! Along the way we spotted yet another finback and another separate humpback that we were unable to photograph. We spotted some splashing in the distance and decided to investigate! The grand finale to our whale watch was watching Spoon, Spoon’s 2015 calf and Mostaza’s 2014 calf splashing around at the surface! 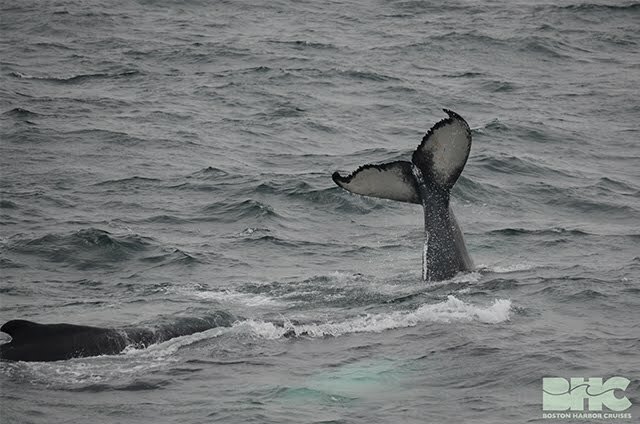 Both the calf and the yearling were rolling about at the surface and Spoon exhibited a huge tail breach which excited our passengers! 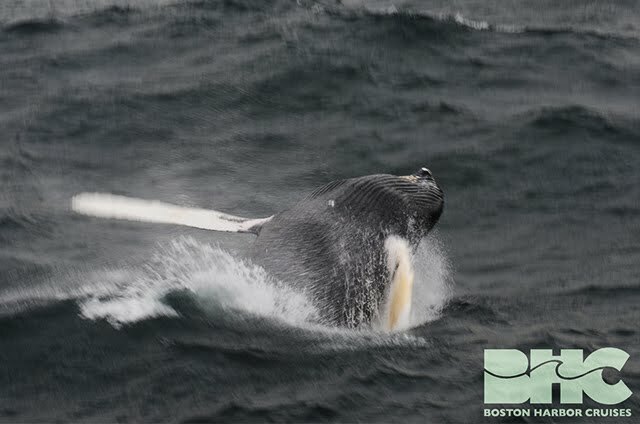 Luckily we had a great whale watch before the forecasted storm rolled in! Today we fought our way through the doldrums of Stellwagen Bank in search of humpback whales. We joined forces again with our friend Captain Jeff in looking for blows amongst the white caps of turbid seas. 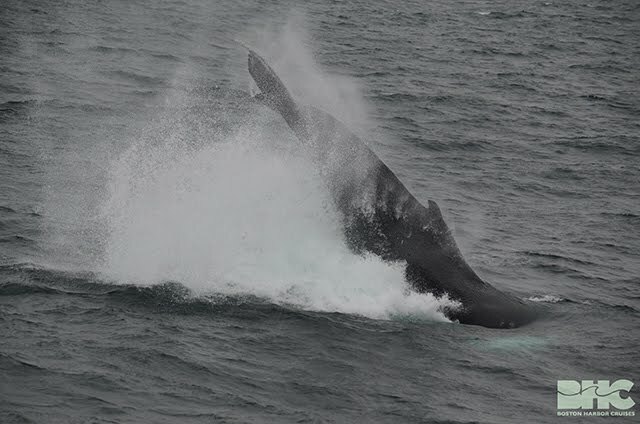 Despite several moments of fruitless efforts, one whale made its presence known with a full breach! We spent a few surface intervals with this ocean wanderer, only to be rewarded with minimal activity and a cease in theatrics. Our Aquarium intern, Foster, jarred my attention as she witnessed a surge of white water erupting off our starboard! She artfully identified this juvenile as Mostaza’s 2014 Calf from the dorsal fin alone! The airborne mountain of blubber and flesh parted the ocean surface in an eruption of white spray, reminiscent of a mechanical submarine returning from its slumber in the unseen abyss. This celebration of power turned into a veritable tantrum, as the youth even began chin breaching and tossing its pectoral flippers about when not fully airborne. The seas themselves became rowdy, as two swells burst upon the port pulpit, leaving all survivors drenched and clamoring for safety in the first deck cabin! Our yearning for whale activity was sated as we departed for terrestrial grounds, and today’s endeavor was a righteous maritime introduction for people new to the majesty of our ocean.